President Donald Trump's former chief strategist, Steve Bannon, has been interviewed as part of an investigation into alleged Russian meddling in the 2016 election. He met with special counsel Robert Mueller, who leads the inquiry, over two days this week. Mr Bannon was chairman of Mr Trump's presidential campaign before becoming a top White House official. But he left his post in August amid reports of tension with other aides. Mr Mueller is leading an investigation into whether the Trump campaign colluded with Russia to influence the US election. Both Moscow and Mr Trump deny this. 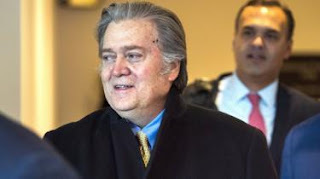 Investigators believe Mr Bannon may hold crucial information on the Trump administration, including details on why former FBI Director James Comey was fired by the president. Mr Comey has previously said he has "no doubt" that he was fired by Mr Trump to "change" the Russia investigation, a charge the White House denies. It is not clear what Mr Bannon was questioned about, but he is reported to have spent around 20 hours speaking with Mr Mueller's team. A source close to the process though told the Associated Press that Mr Bannon answered every question put to him.